Most of the time, our locos run smoothly over points. But occasionally there are problems. 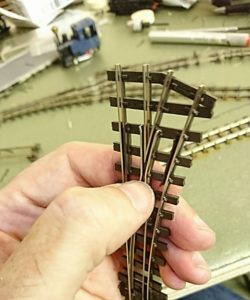 Here’s how I quickly solved a problem that was causing 5 of my locos to bump on the points around my layout. 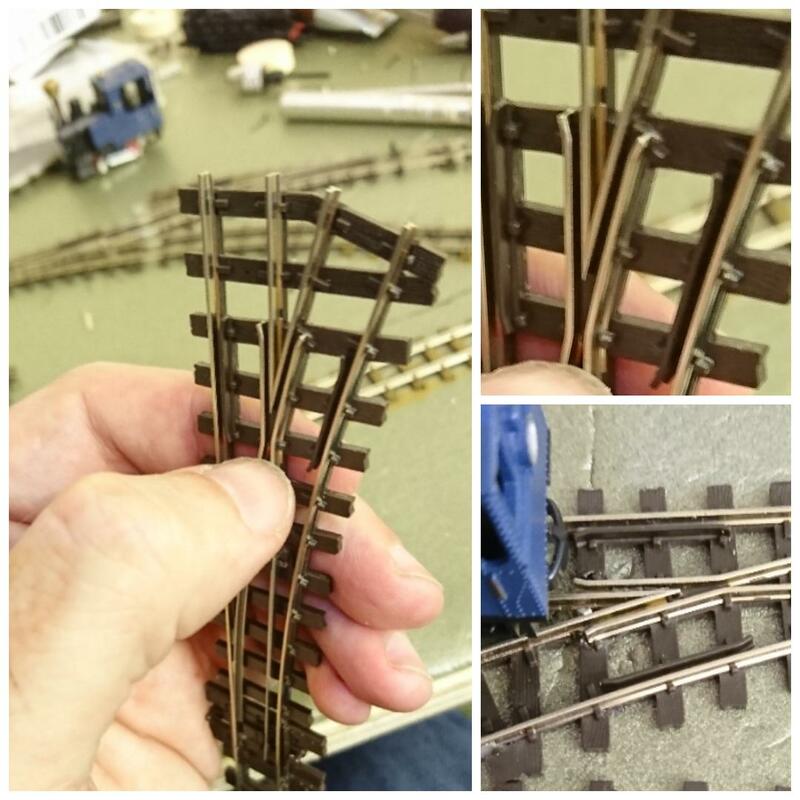 I’ve recently been laying the points and fitting point motors on my narrow gauge layout. It’s all gone fairly smoothly and I’m very delighted with the slow-mo action of the points using the Tortoise motors. However, when running some rolling stock I noticed some of the locos and wagons jumped or hickuped as they went over the point. In particular, five of my locos seemed particularly badly impacted. This jumping looked wrong and I suspect it will derail rolling stock on a regular basis if not tackled. On closer examination, the problem occurred on the frog of the Peco electrofrog points I was using. I pulled on my head visor and switched on the LED light. Rolling one of the engines that exhibited the problem over the frog it appeared to be jumping just as it entered the gap between the frog and wing rails. Examing the point under a higher magnification revealed the plastic a slither of plastic running betweem the rails. It’s slightly recessed but was still catching the flange on some wheels. Once wheel passed this lip it dropped back down to ride normally. I suspect the lip helps keep the rails in place as there isn’t space for the chairs on that side of the rails but it was too tall for the wheels on the five locos. With a scalpel, I very carefully cut away the top of this lip on both sides of the frog. It was a delicate operation to get the blade between the rails but after a little faffing I managed to shave a couple of milimeters off the top of the plastic. You can see before and after here, the first two photos show the frog with the plastic lip just visible between the rails. The third photo show the point after it’s been shaved down. After doing this, all my rolling stock ran over the point flawlessly. I’ve now done the same to the other points and my trains run much more smoothly and a ten minute job has improved the running of my railway immensely. 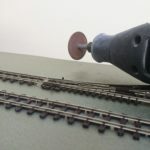 This problem and solution worked for me on Peco 009 electrofrog points but there’s a takeaway for any point causing problems for your rolling stock. Points and trains are made to basic standards but the precise sizing of wheels and rails tends to vary slightly between manufacturers, over time and even between models. Most of the time this doesn’t matter but occasionally it can cause problems, just as it did here. 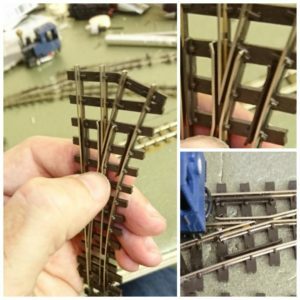 If you have a loco or rolling stock that struggles over the points examine the action of it over of the points carefully. Identify where it jumps or derails. Look for differences in the height of the rails, width of the wheels and flange depth and either gently and carefully modify the point or replace the wheels. Aside from scraping a few millimeters of plastic as was needed in this case, I’ve had points before where the frog rails were slightly higher than the rest. This caused a similar problem and carefully filing them down also worked a treat. Footnote: Modifying the points like this can damage and break them and will void their warranty. 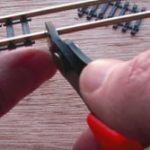 This is not recommended by Peco/Hornby or other manufacturers and you should only do this if you are prepared to ruin the points and lose the support and warranty on them.